I’m go glad you came today! I love having you on this journey with me. Please know you’re on my mind and in my heart every day, and that I pray for you regularly. 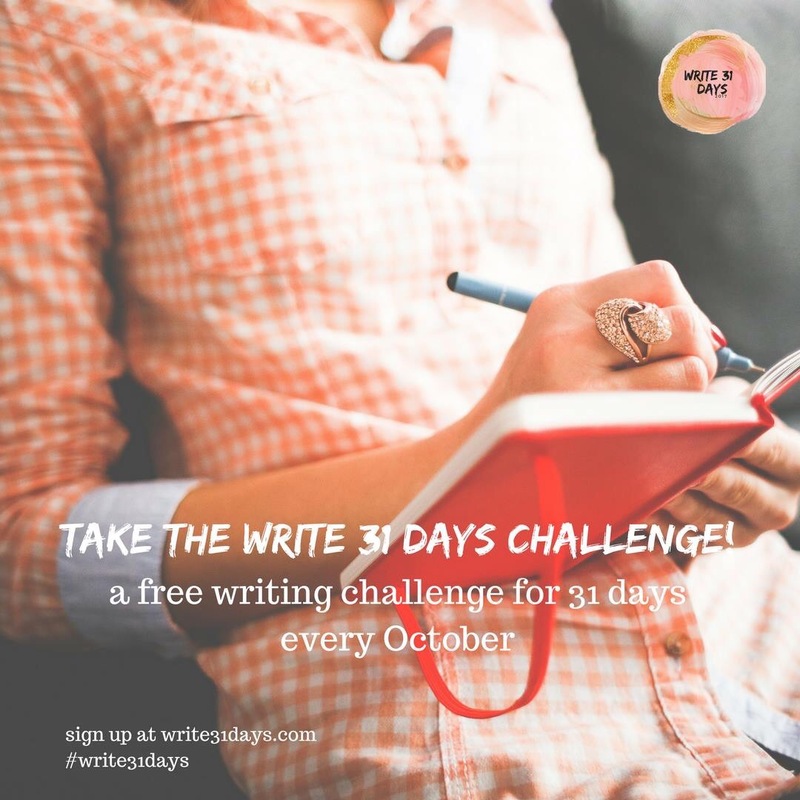 Today, I’m thrilled to share that I’ve been invited to participate in a 31-Day writing challenge with several other Christian writers, authors, and bloggers from across the globe. For the month of October we will each be writing 31 blog posts on a topic of our choice under one of several different subject headings. At first I wasn’t going to participate. To be honest, the challenge scared me a little bit—okay, a lot a bit. I was intimidated. And being a rookie at blogging, I was afraid it would be more than I could handle. But after praying about it for a few days, I realized I’m pretty much doing this anyway, expect on weekends. So I asked God if this was His will for me and this blog. A few days later, after feeling God’s confirming peace, I decided to accept the invitation and give it a shot. My primary goal for this challenge is to grow as a writer. Not just in getting the words out in the right order so something meaningful hits the screen, but more importantly in connecting better with you and your heart. To better encourage you in your faith and relationship with your Savior as you learn to see Jesus in the again-ness of life. We expect to see Him in the BIG things, in the serious things, and in the tragedies. And He’s there! But He’s also in the piles of laundry, practices, traffic, lectures, exams, note taking, and grocery store runs. He’s even in the silly things. The laughter. And the times of rest. My topic will be just that…Discovering Jesus in the Day-to-Day-ness of Life, mostly my life. I do have one request for those of you in high school and college. I would love to hear how things are going in your life: Challenges you are facing. How God is blessing you. Questions you may have. Etc. I’m also collecting ideas for November and December. Feel free to email/message me through my website or social media. P.S. As this challenge will be just that—a challenge, I won’t have time to research for the Deuteronomy devos, so I will pause them for the month of October.